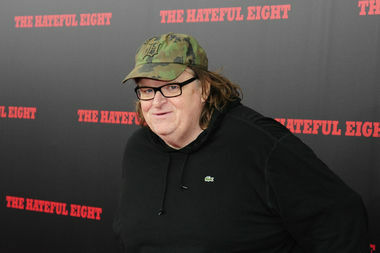 Filmmaker Michael Moore has joined the fight to bring a bookstore to The Bronx. Bronx residents hoping to bring a bookstore back to their borough have a new ally in their fight: filmmaker Michael Moore. The famed director, recently seen at a star-studded protest against President Donald Trump in Columbus Circle, tweeted out his anger about the dearth of bookstores in The Bronx on Friday, saying he had donated to Bronxite Noëlle Santos' campaign to open an independent bookstore in the borough and encouraging others to do the same. Santos, who has launched an Indiegogo page to help raise money for her bookstore, The Lit Bar, said she was "freaking out" about the filmmaker's donation and that he had contributed $5,000 to her cause, which entitles him to rewards including a copy of "Hamilton: The Revolution" autographed by Lin-Manuel Miranda and Jeremy McCarter. She described herself as a fan of Moore's work and said his donation was very moving. "He’s very funny without being obscene," she said, "and he’s just a really awesome person." The last remaining major bookstore in The Bronx was a Barnes & Noble in the Mall at Bay Plaza, but the bookseller announced last year that the location would close at the end of 2016, which it did, the Bronx Borough President's office confirmed. Local elected officials later vowed that the store would return to the borough after remodeling its business plan, but this process is expected to take between one and two years, leaving The Bronx without a bookstore in the meantime. Santos has been working to open The Lit Bar to fill this void and has raised just over $30,000 so far on her Indiegogo campaign. She will start applying for loans to help open the store once she raises $40,000. She said her effort has been gaining a lot of attention and momentum lately, including a show of support from MSNBC host Chris Hayes. Santos has identified a potential spot for the bookstore near the Hunts Point Avenue subway station but is also still considering spots in Mott Haven. She's confident that The Lit Bar will be ready to open at some point this year. "I could open potentially by spring. If something drags, maybe the fall, but absolutely in 2017," she said. "I already gave up my whole 20s for this. It has to open this year."